Page Street Publishing, 9781624146701, 176pp. 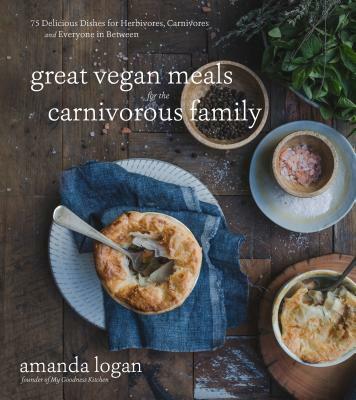 Amanda Logan—the founder of My Goodness Kitchen and a “vegan living with carnivores”—saves you from having to make double the meals and do double the dishes with 75 meatless, egg-less and dairy-free recipes the whole family will love. For die-hard vegans and vegetarians, Amanda takes the flavor up a notch with recipes like Savory French Toast, Vegan Latkes, Easy-Peasy No-Sausage Rolls and Dang Tasty Mexican Black Beans. Devoted carnivores won’t miss meat with dishes like This Lasagna Can’t Be Vegan, Portobello Fajitas and Husband-Approved Tofu Katsu Burger. And to round out the whole family, kids will be begging for more after trying Dairy-Free Stovetop Mac ‘N’ Cheese, Vegan Chili Fries and Chocolate Lover’s Black Bean Brownies. Thanks to Great Vegan Meals for the Carnivorous Family, you can make nutritious, mouthwatering plant-based meals that work for both your family and your healthy lifestyle. Amanda Logan is author and creator of the vegan food blog My Goodness Kitchen. The blog’s thousands of followers on Facebook, Pinterest and Instagram love Amanda’s fresh approach to vegan food and her beautiful photography. Her work has been featured in Vegan Food & Living, The Zoe Report and Junkies. She lives in Victoria, Australia.